Emerging markets will return to double-digit growth of 10%, driving nearly $740B or 35% of worldwide IT revenues and, for the first time, more than 60% of worldwide IT spending growth. IDC also predicted that in 2014 the number of smart connected devices shipped in emerging markets will almost double that shipped in developed markets. In addition, IDC predicts that over the next seven years emerging markets cloud spending will grow seven-fold versus three-fold in developed markets. 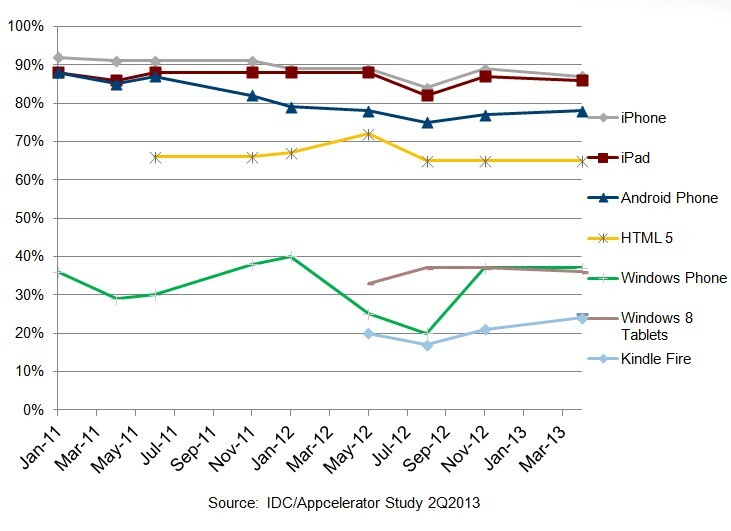 IDC is predicting IT spending in Western Europe will be marginally up, with U.S. and Japan spending marginally down. Worldwide IT spending will grow 5% year over year to $2.1 trillion in 2014. Spending will be driven by 3rd Platform technologies, which will grow 15% year over year and capture 89% of IT spending growth. Smartphones and tablets will lead 2014 growth, accounting for over 60% of total IT growth. Excluding mobile devices, IT growth will only by a modest 2.4%. The graphic shown to the right was shared during the webinar today, explaining the 3rd platform and its contribution to market growth. Within the 3rd Platform, value will start to migrate “up the stack”, from infrastructure as a service (IaaS) to platform as a service (PaaS) and from generic PaaS to data-optimized PaaS. The latter will be most evident as Amazon Web Services rolls out an avalanche of platform-as-a-service offerings for developers and higher value services for businesses. This will force incumbent IT suppliers – the companies that won market leadership in the 2nd Platform era – to urgently reconfigure themselves to fight for position in the 3rd Platform marketplace. Cloud spending, including cloud services and the technology to enable these services, will surge by 25% in 2014, reaching over $100B. 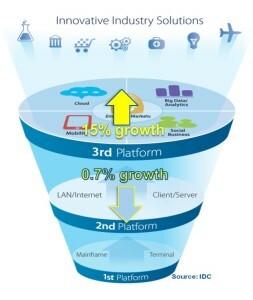 IDC explained the $100B figure includes software, services and cloud infrastructure. IDC also expects to see a dramatic increase in the number of datacenters as cloud players race to achieve global scale. This will be accompanied by a similar expansion in the variety of workload-specialized cloud infrastructure services, leading to new forms of differentiation among cloud service providers. Finally, a pitched battle will be joined for the developers that can create the cloud-based applications and solutions that will fuel the market’s growth. IDC predicts that by 2017, 80%+ of new cloud apps will be hosted on six PaaS platforms. Spending on big data technologies and services will grow by 30% in 2014, surpassing $14 billion as demand for big data analytics skills continues to outstrip supply. Here the race will be on to develop “data-optimized cloud platforms”, capable of leveraging high volumes of data and/or real-time data streams. Value-added content providers and data brokers will proliferate as enterprises (and developers) look for interesting data sources as well as applications that help them to understand their customers, products, and the markets in which they exist. IDC is also predicting that big data analytics services 2014 spending will exceed $4.5B, growing 21% over 2013. Social technologies will become increasingly integrated into existing enterprise applications over the next 12-18 months. In addition to being a strategic component in virtually all customer engagement and marketing strategies, data from social applications will feed the product and service development process. IDC expects enterprise social networks will become increasingly available as standard offerings from cloud services providers. This will enable enterprises to further embed social into the workflow, rather than having a separate “social layer.” IDC also predicts that by 2017, 80% of Fortune 500 companies will have an active customer community, up from 30% today. By 2016, 60% of the Fortune 500 will deploy social-enabled innovation management solutions. Datacenters represent the physical foundation underneath the cloud, and are thus a crucial component of the 3rd Platform. As cloud-dedicated datacenters grow in number and importance, the market for server, storage, and networking components will increasingly be driven by cloud service providers, who have traditionally favored highly componentized and commoditized designs. The incumbent IT hardware vendors, who have struggled to sell into this market, will be forced to adopt a “cloud-first” strategy, designing new innovations for initial release and widespread adoption in cloud service provider datacenters. The 3rd Platform will deliver the next generation of competitive advantage apps and services that will significantly disrupt market leaders in virtually every industry. A key to competing in these disrupted and reinvented industries will be to create industry-focused innovation platforms (like GE’s Predix) that attract and enable large communities of innovators – dozens to hundreds will emerge in the next several years. IDC predicts that most of these industry platform players will not reinvent the cloud underpinnings they need, but will build on top Amazon, Microsoft, IBM, Salesforce, and others’ platforms. In 2014, it will be critically important for these IT leaders to find these emerging industry platform players and win their business. The 3rd Platform will continue to expand beyond smartphones, tablets, and PCs in 2014 to the Internet of Things (IoT). With IoT momentum building in 2014, IDC expects to see new industry partnerships to emerge as traditional IT vendors accelerate their partnerships with global telecom service providers and semiconductor vendors to create integrated offerings in the consumer electronics and connected device spaces. This kind of collaboration and coordination will be necessary to reach the 30 billion autonomously connected end points and $8.9 trillion in revenues that IDC believes the IoT will generate by 2020. 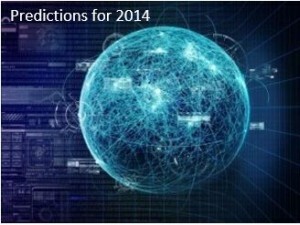 Top Ten Technology Predictions For 2014 is the best thing for all people to know about it. i’m happy get this information.i would to follow this.